The adrenal gland located just above the kidney is composed of two functionally and ontogenetically different endocrine tissues, the cortex and the medulla. Physiological importance of the cortex has been recognized since Addison’s report in 1855. The adrenal cortex consists of three major zones called the zona glomerulosa (zG), the zona fasciculata (zF) and the zona reticularis (zR); zG secretes mineralocorticoid functioning in maintaining normal electrolyte balance, zF produces glucocorticoids regulating carbohydrate metabolism, and zR secretes adrenal androgens. Thus, cells in each zone have an endocrine function unique to the individual zone, and this phenomenon is called the ”functional zonation” of the adrenal cortex. Kendall, Hench and Reichstein shared the Novel Prize in Physiology or Medicine in 1950 on the discoveries of the structure of adrenocorticoids and the biological effects. In 1989, Dr. Mitani and her colleagues identified and purified from the rat adrenal cortex two terminal enzymes responsible for the formation of mineralocorticoid and glucocorticoids. By using antibodies against these enzymes, they succeeded in showing the immunohistochemical evidence on the ”functional zonation” of the adrenal cortex. 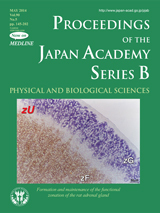 The cover illustration demonstrates such results*; the mineralocorticoid synthesizing enzyme in zG (in violet) and glucocorticoid synthesizing enzyme in zF (in brown) of the rat adrenal gland. At the same time, they discovered a new cell layer between zG and zF, which is devoid of both corticoid-synthesizing enzymes described above, indicating that cells there are functionally immature or in an undifferentiated state as adrenocortical cells. 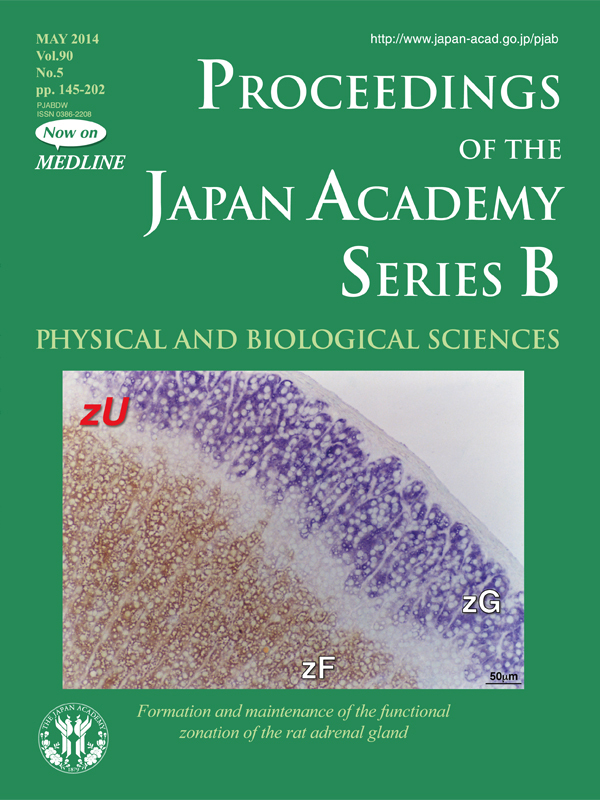 The zone has been designated the “undifferentiated cell zone” (zU: in white in the cover illustration). As reviewed in this issue (pp. 163-183), Dr. Mitani’s group further revealed that replicating cells are present in and around zU with the circadian rhythm, and migrate centrifugally and centripetally from zU. They propose that cells in zU are stem/progenitor cells of the rat adrenal gland, maintaining the functional zonation of the adrenal cortex. *The figure was modified from Fig. 1 in Mitani, F., Suzuki, H., Hata, J.,Ogishima, T., Shimada, H. and Ishimura, Y. (1994) Endocrinology 135, 431-438.